The MO280-KH is specifically designed for home inspection professionals and aids in the identification of moisture, HVAC, electrical and hot water system issues. Kit includes a Pinless Moisture Meter for non-invasive measurement with a depth of 0.75-inch (22mm) below the surface, Min InfraRed Thermometer that's ideal for testing HVAC supply and return applications, a GFCI Receptacle Tester that detects 5 wiring faults in 3-wire receptacles and tests GFCI circuits, and a Waterproof Stem Thermometer with 2.75-inch (70mm) stainless steel stem that's ideal for testing hot water heaters. Supplied in an attractive storage case that provides protection and organization for the testers whenever they are needed. 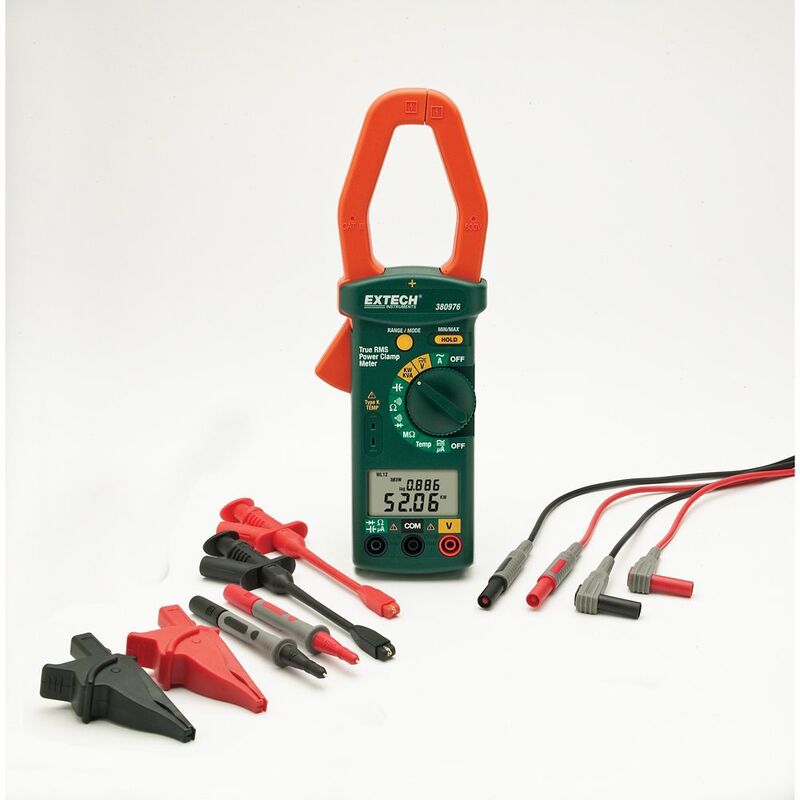 Single Phase/Three Phase 1000A AC Power Clamp Meter Kit The 380976-K is an AC Power Clamp and test lead kit that measures 1- and 3-phase true power (kW), apparent power (kVA), and reactive power (kVAR), plus horsepower (HP), power factor, and phase angle with lead/lag indicator, high resistance tests to 100MOhms, type K, switchable, temperature to 1000 degree Fahrenheit, diode and continuity tests and auto power off with disable feature. Clamp meter has a 1.6 in. (40mm) jaw opening. In addition, this kit includes 2 CAT IV 72 in. test leads, 2 modular test probe handles, 2 plunger activated jaw clips, and 2 extra-large alligator clips. Complete with test lead kit, Type K probe, carrying case and 9 Volt battery.